A paramagnetic iron (Fe) complex (upper left) binds H2 reversibly and is converted under H2 to a diamagnetic dihydrogen-hydride complex (bottom right) through a mechanism involving a net hydrogen atom transfer. Enlarge Image. Hydrogen-based fuel cells hold promise for sustainable power generation, but to become practical they need to be more efficient and cost effective. Scientists at PNNL's Center for Molecular Electrocatalysis (CME) are working to understand the fundamental reactivity of H2 that could contribute to making hydrogen a more widely used fuel source. 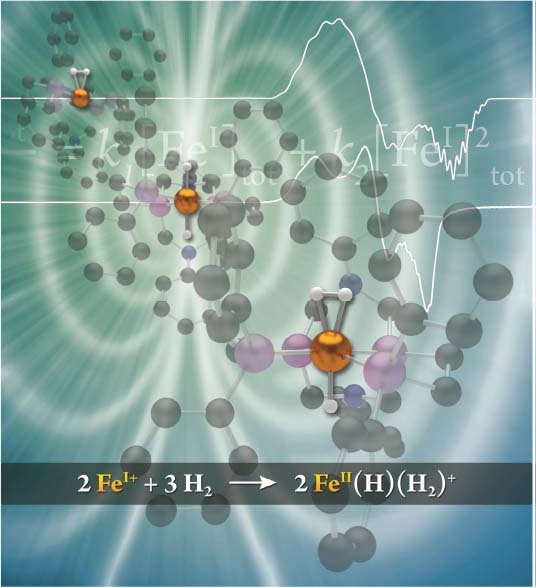 Working with a rare iron-based paramagnetic complex, a CME-based research team for the first time reported the mechanism of reactivity of hydrogen and explained in detail how hydrogen atoms are transferred. Their study, "H2 Binding, Splitting, and Net Hydrogen Atom Transfer at a Paramagnetic Iron Complex", appears in the Journal of the American Chemical Society. Paramagnetic dihydrogen complexes are difficult to study because they cannot be examined using the traditional method of nuclear magnetic resonance spectroscopy. The CME research team combined kinetic, spectroscopic, electrochemical, and computational evidence to reveal that the reaction of the iron complex starts from a single hydrogen molecule (H2) bound to the metal. The subsequent reaction proceeds through an unusual cleavage of the H-H bond of H2 mediated by two iron centers. Metal complexes in which hydrogen (H2) binds to the metal are key intermediates in many catalytic reactions important for energy conversions. "Only a very few paramagnetic dihydrogen complexes have been reported, and their reactions have not been explored," said Morris Bullock, director of the CME. "This remarkable reaction contributes fundamentally important new understanding to guide the design of new catalysts and electrocatalysts." Acknowledgments: This research responds to the Priority Research Direction (PRD) "Design catalysts for efficient electron-driven chemical transformations" and is responsive the PRD that highlights the need to "Drive new catalysts discoveries by coupling data science, theory, and experiment." Sponsors: This work was conducted in the Center for Molecular Electrocatalysis, an Energy Frontier Research Center funded by the U.S. Department of Energy (DOE), Office of Science, Office of Basic Energy Sciences. Electron paramagnetic resonance spectra experiments were performed using the W. R. Wiley Environmental Molecular Sciences Laboratory (EMSL), a national scientific user facility sponsored by the Department of Energy's Office of Biological and Environmental Research and located at Pacific Northwest National Laboratory. Computational resources were provided by the National Energy Research Scientific Computing Center (NERSC) at Lawrence Berkeley National Laboratory. PNNL is operated by Battelle for the U.S. DOE. User Facilities: A portion of the research was performed using the W. R. Wiley Environmental Molecular Sciences Laboratory (EMSL), a national scientific user facility sponsored by the Department of Energy's Office of Biological and Environmental Research and located at Pacific Northwest National Laboratory.